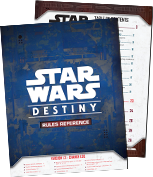 The latest version of the Star Wars™: Destiny Rules Reference is now online! This update contains the usual streamlined rules, clarifications, new FAQs, and other minor changes that come with refining the rules. In addition, today’s update includes errata to a couple of cards that players should be sure to read about. Learn why these changes were made directly from the developers in the paragraphs below, and then download the new Rules Reference to see all the changes for yourself! Click on the image above to see the new Rules Reference. This update goes into effect 5/8/2017. Hello Star Wars: Destiny players! We hope that you are as excited for the Spirit of Rebellion release as we are. 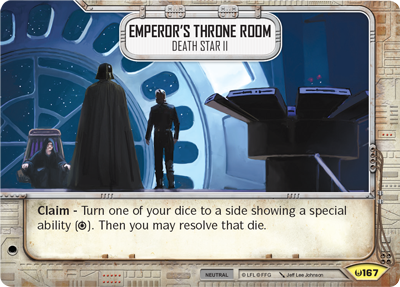 In pursuit of the clearest and most intuitive rules for Star Wars: Destiny, we have made several updates to the Rules Reference. Included in this document are clarifications for questions about many of the new cards from Spirit of Rebellion, and we will continue to update the document as we deem necessary for clarity. The most important change, however, is the addition of an Errata section. Errata are changes that are made to cards after they are printed to ensure intended functionality or bring balance to the competitive scene (the "meta"). Because the current printed cards will no longer match the real gameplay text, this is not a decision we take lightly. But there are two cards that we feel we cannot leave alone without negatively affecting the game and meta. The first errata is to Hyperspace Jump. With it's new text, instead of discarding itself after resolving like other event cards, it is now placed in your set-aside zone. 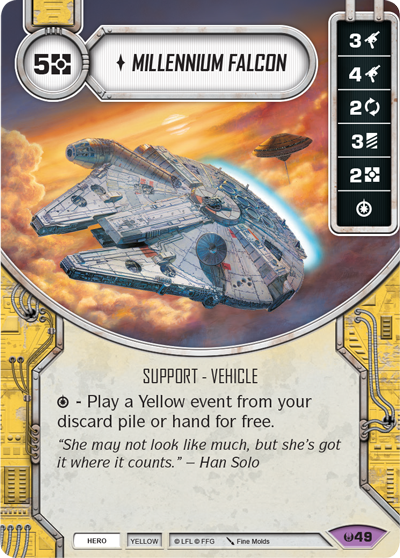 We made this change because of a combo using the Millennium Falcon and the Emperor’s Throne Room to keep playing Hyperspace Jump over and over, allowing a player to end the Action Phase at will. Even though the deck has not won many tournaments in the Awakenings environment, it is very frustrating to play against. 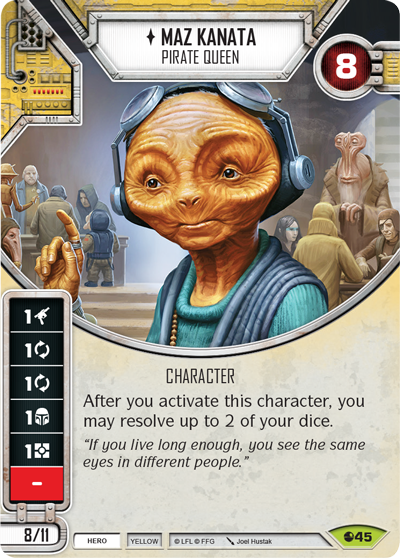 With additions like Maz Kanata and Planetary Uprising from Spirit of Rebellion bolstering this strategy, we wanted to make this change before the improved deck adversely impacts the meta and the play experience. Making the errata to Hyperspace Jump, versus one of the other cards in the combo, made the most sense for two reasons. 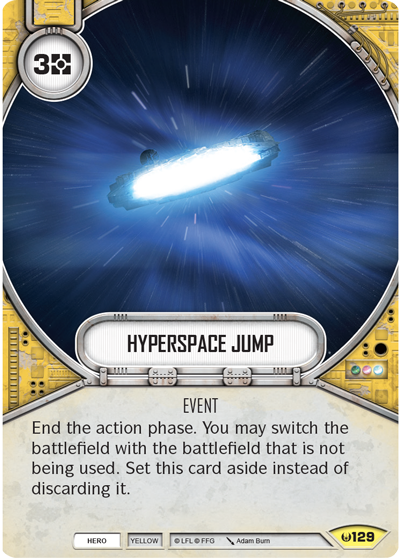 First, Hyperspace Jump is an uncommon card, not a legendary like the Millennium Falcon. In addition, most casual players who are not using a way to bring it back again and again will continue to play Hyperspace Jump as intended, even with the errata. 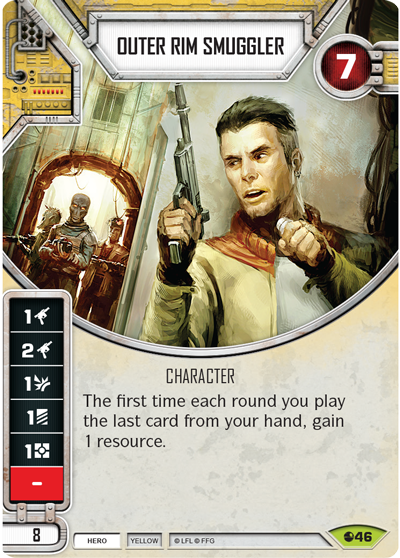 The second card we issued errata to is Outer Rim Smuggler. It is unfortunate to have to change a card upon release, but we are acting to prevent abuse of an unintended combo. 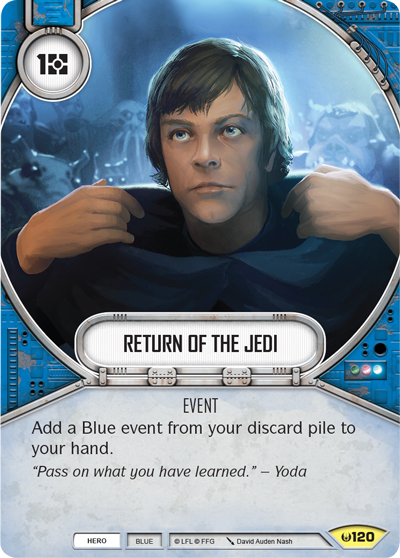 For example, if you have two Outer Rim Smugglers and two copies of Return of the Jedi, one in your hand and one in your discard pile, then you can generate infinite resources by playing and targeting the Return of the Jedi cards. When necessary, we will take proactive steps to correct problems before they occur and ensure that players can enjoy their tournament experience. In this case, each Outer Rim Smuggler can now generate only 1 resource per round. There are several other changes worth noting. We formalized several game terms, like “rolling” and “replacing” upgrades. We removed references to “remove from game” and replaced it with the “set-aside zone.” The set-aside zone is where you keep your dice that you bring with you to a game, and it now also holds defeated characters and cards like Hyperspace Jump that do not go to your discard pile after being played. We added more explanation about queues. And finally, we simplified what counts as passing and not passing when players trigger actions that do nothing. If you have any questions about these changes or clarifications you would like to see in a future update, please fill out our Rules Question form. 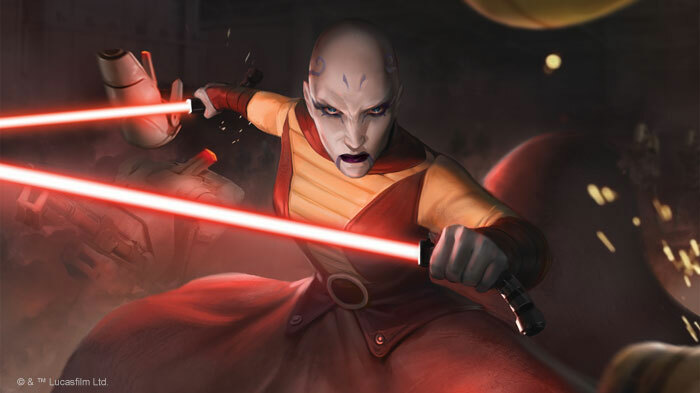 Download the new Star Wars: Destiny Rules Reference now to read the entire update. If you are someone who plays in tournaments, don’t forget to read the errata! They may alter what you are expecting to see at events. Please note that the new version of the Rules Reference becomes effective on May 8th. This ensures that the World Championships, May 3rd-7th, are not impacted by the errata. Store Championships, held from May 13th through August 27th, will be the first official events using the new errata. The other clarifications can be used to answer questions beginning now. 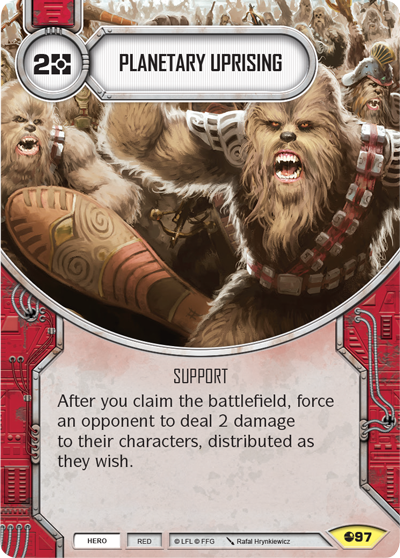 As always, game rules, tournament regulations, and other support materials for Star Wars: Destiny can be found on our Star Wars: Destiny page.